Today I have the second half of OPI's Swiss Collection for fall 2010. This half of the collection is composed entirely of glittery, shimmery polishes and is, aside from Ski Teal We Drop, the standout half of the collection in my opinion. Check out the swatches and let me know what you think! I'm of the opinion that a good gold is hard to find. I have a lot of polish, but there is only ONE gold polish that I truly love: OPI I Get a Kick Out of Gold. I have been searching long and hard for a similar gold because I LOVE I Get a Kick Out of Gold so much. My search has ended here. Glitzerland is a STUNNING, shimmer gold. It is just stunning without being gaudy or too sparkly. I am absolutely buying another bottle of this - I love it! Glitzerland covered well with three coats and dried very quickly. It also works great as a Konad stamping polish, as you can see HERE. Gah, this is so GORGEOUS!! Shimmery jewel-toned purple loaded with pink and gold microshimmer. This is such a pretty color, indoors and in the sun. I used three coats, but it covered really well with two. It dried very quickly (I was able to stamp over it in just a few minutes) and has a great shine even without a topcoat. Diva of Geneva (isn't that such a cute name?) is a beautiful polish. 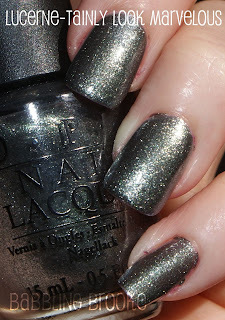 Lucerne-Tainly Look Marvelous (ok, that is a tough on to type) is a dark, gunmetal silver with lots of shimmer. This is a very unique silver because it is a) dark, b) shimmery. I kind of wish this had some glass-flecked glitter in it - not saying I don't love it though, because I'm actually really excited about it. Maybe I'm just craving glassy glitter flecks right now. It's a cool color, and I know I'll be doing something with this and snowflake designs come winter. It covered great with two coats, the formula was just excellent, and it dried quickly. Slightly frosty pale silvery purple with a moderate amount of microshimmer. It took four coats for full coverage, but applied nicely and had an average dry time. This worked really nicely as a Konad stamping polish. Very pretty - I can see myself wearing this during the winter. Dark green with lots of very fine shimmer. Covered well with two coats. Dried moderately fast (not as quick as the other for some reason, but still pretty fast). It has a very nice formula and is a rich emerald green polish. Yodel Me on My Cell is a medium vibrant blue with lots of bright, sparkling shimmer. It covered well with two coats and dried very fast. This is a very pretty, standout shade that will be great for summer as well as winter. The entire OPI Swiss Collection will be available in most salons as well as Ulta & Trade Secret in early August. To learn more, visit OPI.com. 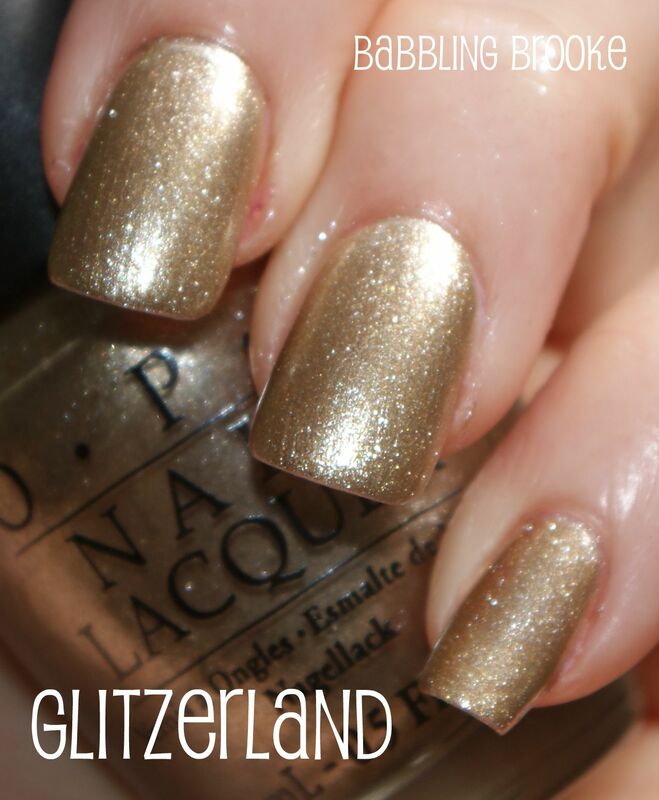 Which glitters are your favorite in OPI's Swiss Collection? Do you like the cremes/jellies best, or are you more partial to the shimmery polishes? Thanks for checking out the OPI Swiss Collection!! The Color to Watch and Cuckoo for this Color are really pretty!!! Definitely my favorites from this collection! Diva of Geneva and The color to watch are my favourites! Diva of Geneva is my kind of color!! WAAAAAAANT!!!! Brooke! Remember me asking you about China Glaze Xmas colors? I went thru a link on Mary's blog to ALU's post about it! Based on the pics.....eeeeeeeeeeee! P.S. Loving the OPI swatches! Waaah! I want them all! Diva of Geneva is my favourite of these swatches. I don't know if I've seen anything similar to that before. It's just gorgeous! I didn't even notice The Color to Watch in the promos, but HELLO! Your swatches tend to make me want every polish haha! I'm buying The Color to Watch ASAP! Mmm, Glitzerland is very nice! I love Yodel Me on My Cell, Cuckoo for this Colour and Diva of Geneva. I love these, especially Glitzerland and Diva of Geneva! I actually prefer the other half of the collection, though. Thanks so much Gwenn, Jen, Serena, and Megan!! Kathy, I saw them - they are GORGEOUS!! Not sure when they will be available, but it can't be too much longer. I'm so excited about them!! Sammer, I was thinking the same thing - I don't think I have any even near dupes to Diva of Geneva. It is so pretty!! Aurora, I loved it SO MUCH MORE once I tried it on - The Color to Watch just kind of blended in with the others in the promo pics, but I really, really like it on my nails. Glad you do too!!! Brooke, I just stumbled upon your site and you rock! I so appreciate your swatches. I am buying every last one of these OPI's! Thanks and you are cutie pie! Loves it!! So are Glitzerland and I Get a Kick Out of Gold basically the same color? I almost got Glitzerland, so if it is very similar to I Get a Kick... I don't want to waste my money since I have that. Thanks. karma, thank you SO MUCH!! :D love your sweet comment! !